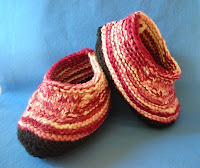 I finished my moccasin slippers. 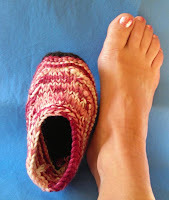 I found the link on Ravelry and the lady did say they looked small, but fit her ok. Well, they definitely look small and although they do stretch and fit I find them a little uncomfortable to wear without socks. Why? because the stitches just feel funny on my toes. They were knit rather tightly and I wasn't too keen on knitting these up using my circulars so maybe next time I'll try one needle size bigger and use straight needles. They are kinda cute and a nice stash buster. Yes, my stash keeps growing!